In 2017, ATD Fourth World invited people around the world to document real-life “Stories of Change” starting from situations of injustice and exclusion caused by extreme poverty. These stories, from activists, community leaders, and others, show that when people work together, real change can happen. For more about the “Stories of Change” blog, click here. As well as struggling every day for her own children to have an education, a mother supports her neighbors when they have difficulties sending their children to school. On two occasions in the past, I have worked for projects offering scholarships to children and teenagers. Both projects enabled me to learn the importance of the connections between school, pupils, and parents. But they also enabled me to understand the efforts made by parents in supporting their children beyond the money they may be given from people outside the family circle. Being granted a scholarship is indeed not a guarantee that children will actually attend school and even less that they will succeed. I have known Dona Telma since I was a child. We used to live in the same poor neighborhood of Guatemala City. Together with my mother, she would wash other people’s clothes at the municipal reservoir close to where we lived, while I would play with her eldest daughter. She was always a woman of character, a very serious person who did not really interact with others. She was dedicated to earning income and to the education of her children. Several years later, my work enabled me to meet her again, only this time it was to support three of her children who had been granted scholarships. Dona Telma had never learned to read and write. Her family life was economically very hard, and she could never afford to attend school. Her hard life was mirrored in the difficulties her children had at school. Her eldest daughter did not complete primary school and from a very early age she had to start working to support the family. At the time, because Dona Telma could not read or write, she was not self-confident enough to help her children with their studies. Gradually, however, I saw her become more self-confident. For instance, one time she went to the school by herself to speak to the teachers and find out about her children’s progress. This took a lot of courage. We both belong to ATD Fourth World in Guatemala and over the years, during the meetings that I attended with Dona Telma, her words became clearer and her strength more obvious when she spoke. The support from ATD Fourth World Volunteer Corps members has proved to be very important in encouraging her to talk with the teachers. When I accompanied her daughter to school, I saw Dona Telma demonstrate her strength. She walked confidently up to the teacher to talk about her daughter’s situation. “I only want to defend my children’s rights,” she said. Another situation showed how far Dona Telma had come. Over a period of two days, she waited in front of the school that would not register her son for next years’ classes. He had not managed to graduate from primary school at the maximum age designated by the system and therefore had not been accepted for further studies at his school. It took so long to talk to school officials that Dona Telma often slept while she waited to register her son. Despite the initial refusal of school officials, she nevertheless insisted over and over again until the headmistress came out to her and asked, “Aren’t you tired?” — which prompted her answer, “I am tired indeed, but I want my child to be able to study and I do not want him to have to lead a hard life in the future”. Last year, her son graduated as a graphic designer. On graduation day, Dona Telma was full of joy and hope, but she was most of all proud that her efforts paid off. Although he had won a scholarship, the family had to make huge efforts to afford his daily food, as well as his health and transportation needs. Above all, however, this success required a tremendous personal effort from Dona Telma to meet with the teachers and ask them about her child’s progress and difficulties. The perseverance she learned was something she could share with other parents. For example, she supports her sister with her children’s schooling in a number of ways. Her sister has to go out every day to sell items to support her family. Dona Telma attends her nephews’ parents’ days occasionally. She tells her sister’s children how important it is to study; she sometimes cooks their meals for them. Her support helps her sister not feel alone in this process. She has someone who can help her to communicate with her children’s teachers. In addition to supporting her own family, Dona Telma is also there for her community when her neighbors experience problems in sending their children to school. Some time ago, she told me of a mother who was about to take her child out of school because she did not have the money to pay for the books required. Dona Telma offered to lend the books to her so that she could make copies of them, and thereby make it less expensive. With this practical support, the neighbor realized that it was possible for her child to stay in school. Through the relationship I had with Dona Telma, I came to understand that it is much easier for the parents to get involved in the school when there is an atmosphere of openness, dialogue and respect. Moreover, the children become more interested in school and more confident. At the same time, the children make progress when they see their parents follow up on what is happening in school, and when they see the teachers respect their parents. 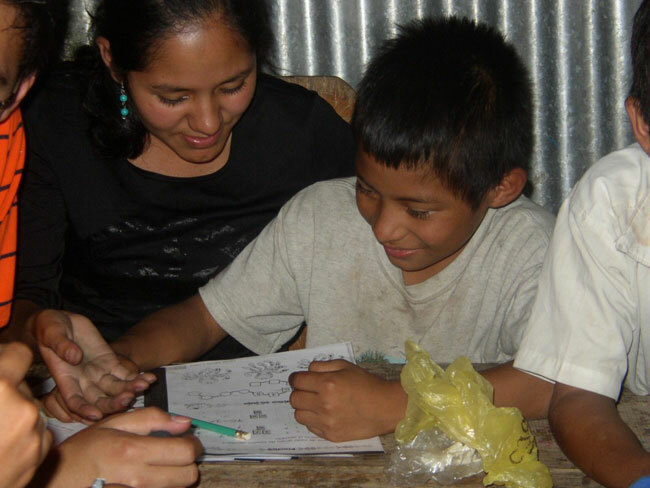 The learning support with various children of the community and conversations with other parents have made it possible for Dona Telma to understand better the role she can play to support children in their learning. What is important is to enable people to have their voices heard and for them to defend their rights. When they succeed in doing this, then they can share that strength with others.